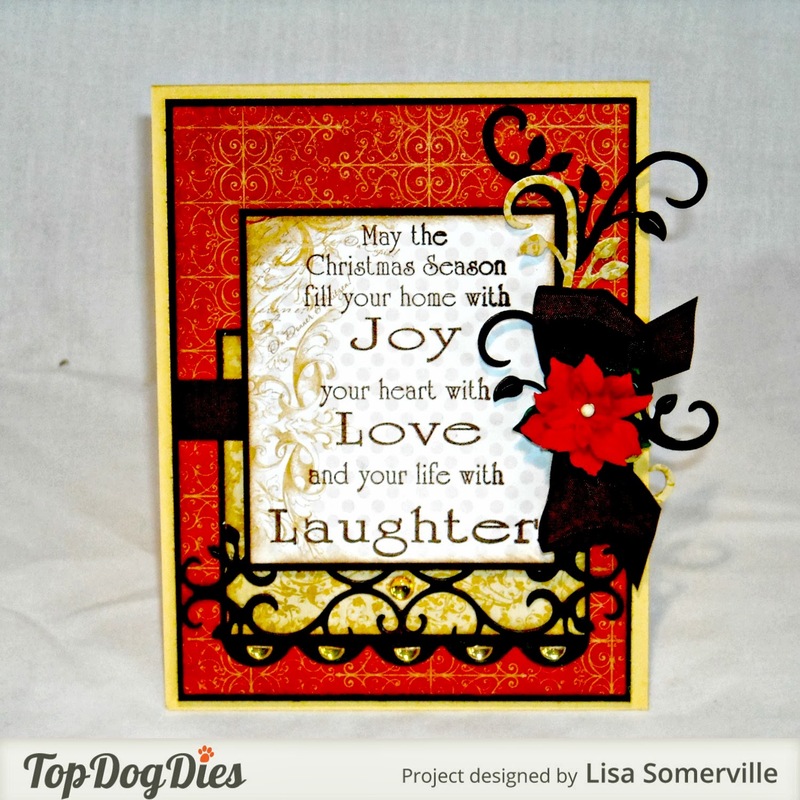 Inspired by this weeks Mojo Monday Sketch, I created my card with stamps from Verses, Bo Bunny pattern paper and dies from Top Dog Dies. The sentiment is stamped in Coffee Archival on a scrap of Bo Bunny pattern paper, sponged with Gathered Twigs Distress ink and layered on an Espresso panel. I die cut the scallop layer from Espresso card stock using the Pocket Album Die,cutting the end a little shorter to fit the sketch. To embellish the scallop panel, I die cut the Leafy Flourishes Die from Espresso card stock, adding the border panel across the top of the pattern paper. I die cut additional flourishes from Espresso card stock and scraps of the pattern paper and adhered them under the Vintage Brown Seam Binding Bow, then added a Prima Poinsettia and gems to finish the card. Love the beautiful colors! Gorgeous design! 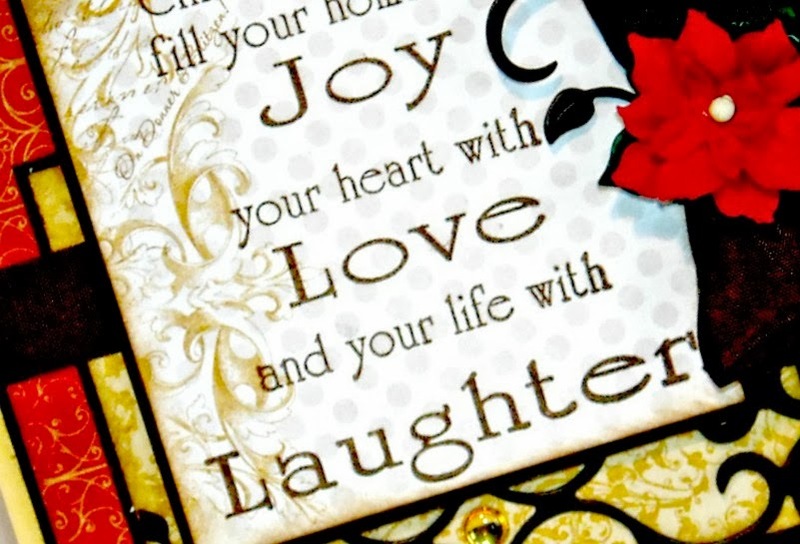 Beautiful card Lisa! The DP is so pretty- love your take on the sketch! Great card...the black really makes the colors pop. 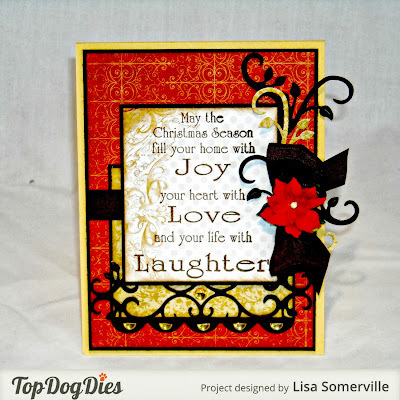 Thanks for playing along with us in the Holiday/Christmas Challenge this week at the Simon Says Stamp Wednesday Challenge Blog!